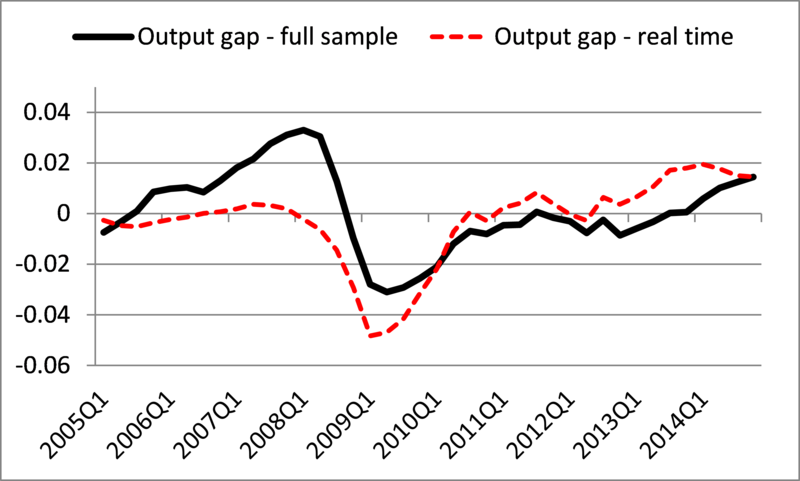 Like in most advanced economies, output fell significantly in the UK in the aftermath of the financial crisis. There is an ongoing debate on to what extent this fall could be explained by output having grown above its sustainable level; in other words, was there a positive output gap before the crisis? 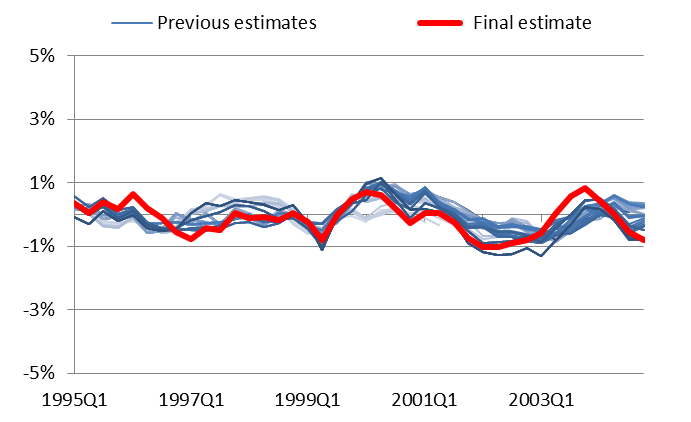 I argue that using financial market indicators in addition to more traditional macroeconomic variables to explain output fluctuations helps in constructing a consistent real-time narrative of a positive pre-crisis output gap in the UK. In macroeconomic literature, the output gap is normally defined as the difference between observed actual output, and unobservable potential output, where the latter can be subject to various theoretical or empirical restrictions. Consequently, the output gap can have different interpretations. From a monetary policy perspective, the measure can be interpreted as the difference between actual output and the hypothetical level of output achieved when nominal rigidities in the economy are absent. This implies that the output gap can be used as a measure of inflation pressures; a positive output gap points to heightened pressures, while a negative gap indicates weakened pressures. Hence, this interpretation is meaningful as a tool for determining the stance of monetary policy, which has a focus on achieving an inflation target over the medium term. Furthermore, from a practical monetary policy perspective, it is important to be able to come up with accurate estimates of the output gap in real time to avoid the types of policy mistakes caused by inaccurate estimates (see, for example, Orphanides (2003)). However, the output gap can also have other interpretations. For example, it can be seen as the difference between actual output and a long-term, sustainable output path, without any reference to inflation. In the analysis that follows, I do not put a strict theoretical restriction on the concept of the output gap. Instead, I build a measure of the output gap based on a handful of relevant macroeconomic and financial variables, and then focus on the plausibility and the real-time narrative related to that measure. Despite their policy relevance, output gaps are not directly observable, and there is no consensus in the economics profession on the best method for estimating them, or on the exact conceptual meaning of the term. Statistical approaches rely on decomposing actual output (in other words, real GDP) into a trend and a cycle component. Depending on the technique used, this decomposition depends on various assumptions on, for example, the frequency of cyclical fluctuations, the smoothness of the trend representing potential output, and the co-movement between cyclical fluctuations and other, possibly observable variables. Different approaches for estimating potential output and output gaps have been developed, ranging from simple time-series methods to more complex structural model based decompositions. Perhaps the simplest method is the so-called Hodrick-Prescott (HP) filter, which decomposes the GDP series based merely on assumptions made on the relative volatility of the trend and the cyclical component. It has the advantage of being very easy to implement. However, it is well established in the literature that this type of simple method used for trend-cycle decomposition tends to have an “end-point” problem, meaning that with incoming data estimates close to the end of the sample get revised significantly. This property renders decomposition approaches relying on standard univariate filters unsuitable for real-time policy analysis. 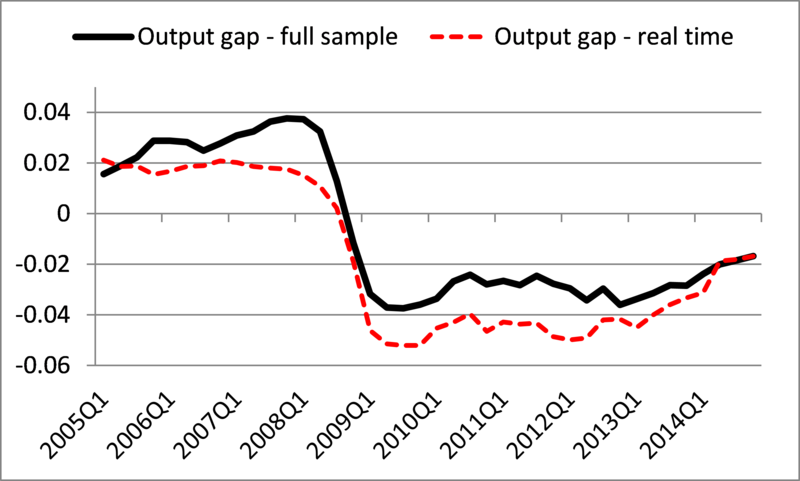 As an example of this, Chart 1 illustrates how the size of the pre-crisis output gap estimates from the HP filter changed substantially as new data became available. Earlier estimates are represented by lighter shaded lines, with more recent series appearing darker. Given this end-point problem, researchers have come up with more complex, and theoretically more appealing methods for estimating output gaps. I have used one such method (introduced in more detail in Melolinna and Tóth (2016)), which is a small semi-structural unobserved components model. The model uses Bayesian methods to combine prior assumptions and the information content in the data to come up with the optimal solution for all the parameters of the model. Theoretically, the model is based on well-established macroeconomic relationships between GDP, unemployment and inflation. Additionally, the model – uniquely – includes a financial conditions index (FCI), consisting of eight financial market variables. These variables are price and volume measures of different market sectors, and they can be expected to contain some information on macroeconomic as well as financial market dynamics. Hence, the FCI attempts to account for the macro-cyclical signal of financial market variables for the estimation of the output gap. As potential output and hence the output gap are unobservable, it is not possible, even with hindsight, to know with any sort of certainty how accurate these estimates are. However, there are ways in which we can measure the relative performance of different models. The main way I use here is related to the end-point problem mentioned above; those models which are revised less when new data becomes available are better candidates in terms of their real-time performance and relevance for policy-making purposes. Chart 2 shows the actual real-time performance (using real-time vintages of GDP and the financial conditions index) of the output gap measure for the HP filter and the unobserved components model using the FCI. It can be shown that unobserved components models typically outperform the HP filter. However, the FCI model performs even better than simpler versions of the same model structure, which exclude the FCI. The FCI model captures the output gap dynamics relatively well in real time, also including the pre-crisis “overheating” period. To put a numerical value on the relative real-time performance, I calculate the absolute value of the mean deviation of the full sample output gap estimate from the end-point of the real-time estimate (the dashed lines in Chart 2) at each quarter from 2005Q1 to 2014Q4, and divide this by the standard deviation of the full sample gap. This measure of standardised average errors is nearly twice as large for the HP filter compared to the FCI model over the sample, which points to a clear improvement when using the FCI model. Sources: Bloomberg, ONS and author’s calculations. 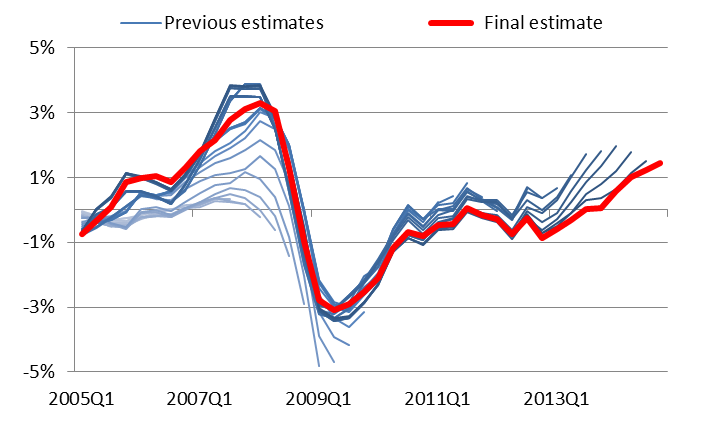 The charts show estimates with the full sample along with real-time estimates with rolling end-points for estimation (with real time FCI and GDP data ) at different points in time. Overall, my results suggest that the real-time performance of the FCI model is better compared to the other competing models and hence, the FCI does include information that is useful for estimating output gaps in the UK from a practical monetary policy perspective. Furthermore, it is encouraging to see how well the FCI model is able to pick up the high volatility in output experienced during the financial crisis period in real time, which also suggests a larger role played by financial variables as a cause for macroeconomic fluctuations in the UK than traditionally claimed. Previous Post Less is more: what does mindfulness mean for economics? Next Post The growth of peer-to-peer lending platforms and prospects for banks’ disintermediation – hype or real threat? David Arseneau and Michael Kiley wrote up a similar analysis for the United States in a 2014 FEDS Note that you may want to read and reference in your research paper: http://www.federalreserve.gov/econresdata/notes/feds-notes/2014/the-role-of-financial-imbalances-in-assessing-the-state-of-the-economy-20140418.html .